Arroyo Vineyard: This Napa vineyard is near the base of the Palisades in Calistoga. The soil there is well drained Bale sandy loam, with some alluvial rocky soil underneath. The vineyard is an exception in that it is the only site that is dry farmed. Santa Rita Hills: This vineyard lies west of highway 101 in Santa Barbara County in a very cool site that receives a lot of coastal fog and cold air. This creates an environment that prolongs the growing season and retains more of the cool climate spice inherent in Syrah. Schatz Vineyard, Lodi: Dark red soil and a frequent maritime fog produce lovely raspberry, cherry flavors that are juicy and gratifying. The aromatics have a mild smoke and tobacco aspect with a meaty side. What do these elements create? Big juicy dark fruit, a round luscious palate. In short a wine that makes for an accessible, tasty Syrah. Unti Vineyard, Dry Creek, Sonoma: This region is well known for Zinfandel, yet the Unti Family has mastered the Rhône varieties of Syrah & Grenache. The vineyard is well drained, cobbly, alluvial soil. 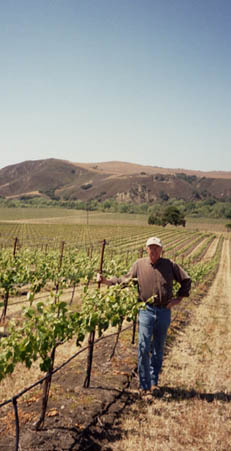 Fairbairn Ranch, Mendocino: Vineyard Manager Jerry Yates has been practicing bio-dynamic viticulture for many years. While I was initially skeptical about bio-dynamics and Rudolf Steiner, the quality of the fruit from this vineyard has made me a believer. Kick Ranch: Kick Ranch rests on the fairly steep hillside in the Rincon Valley above Santa Rosa, and it has a clear shot to the fog of the Petaluma gap. Purisima Mountain: Purisima Mountain is owned by the Beckmen family in Santa Ynez. The vineyard is bordered by Stolpman to the North and Cool Hand to the South. It lays on the Western most border of the Santa Ynez appellation and it neighbors the cool Santa Rita Hills appellation. The site gets significant fog at night and the morning, but it usually burns off by 10-11 am. Peay Vineyard: The Sonoma Coast appellation is so large it has lost any significant meaning to me. However, this site is with in 5 miles of the Pacific ocean. As a result it is harvested last and maintains cooler temperatures through out the year. To summarize: an amazing site to grow Syrah. Kick Ranch : Kick Ranch rests on the fairly steep hillside in the Rincon Valley above Santa Rosa, and it has a clear shot to the fog of the Petaluma gap. Westerly Vineyard, Santa Ynez, Santa Barbara: Santa Ynez is somewhat warmer than many parts of Santa Barbara, but the site for the Roussanne is a lower section in the vnyd and thus cooler and well suited for this finicky grape. Unti Vineyard, Dry Creek, Sonoma: This region is well known for Zinfandel, yet the Unti Family has mastered the Rhône varieties of Grenache & Syrah. The vineyard is well drained, cobbly, alluvial soil. The Grenache, grown closer to the creek, yields one cluster per shoot and requires a great deal of labor to maintain.